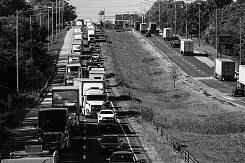 Traffic sits backed up along eastbound Interstate 80 on Monday in Joliet. The chairman of the state tollway board laid out a case to the Joliet City Council on Monday for turning the local stretch of Interstate 80 into a toll road. “We at the tollway are ready to help,” Chairman Bob Schillerstrom told the council. Schillerstrom was asked to make a presentation on the Illinois Tollway’s capacity to fund I-80 improvements. He said turning the local stretch of road could speed up the pace of a $1 billion plan that the Illinois Department of Transportation now has for I-80 from New Lenox to Minooka. “IDOT has said they may not have funds to work on 80 for 20 years,” Schillerstrom said. Mayor Bob O’Dekirk said he invited Schillerstrom to the council meeting after hearing him make a similar presentation to a new I-80 Coalition of government and business leaders that was created to push for progress on the planned improvements. O’Dekirk said he gets “a real mixed reaction” when he speaks to Joliet gatherings about the possibility of turning the local section of I-80 into a tollway. Many people find waiting 20 years for the improvements “intolerable,” he said. The mayor asked what possibility there would be for toll exemptions for local drivers. Schillerstrom said it was unlikely. “I believe everybody who gets on that road is going to have to pay a toll,” Schillerstrom said. Councilman Larry Hug also spoke about resistance to tolls. Schillerstrom said local government officials would need to support the conversion of I-80 to a tollway to make it happen. They would also need support from state lawmakers, who would have to pass legislation to make I-80 a toll road. Federal highway authorities also would need to approve, but Schillerstrom said he believed that was likely. He presented a map showing I-80 operating as a toll road from the East Coast until it enters Illinois. Growing traffic, especially from semitrailers, and crashes that lead to deaths or clog the interstate have spurred growing public interest in expanding the capacity of I-80 through Joliet. Some measures planned by IDOT include more lanes, new bridges and modernized interchanges. Work recently started on improvements at the U.S. 30 interchange in New Lenox.